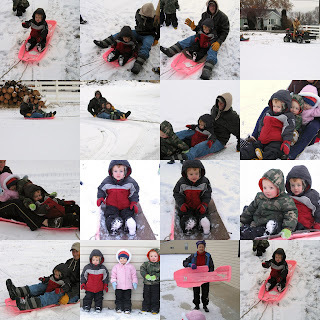 While we were up north we went sledding in G&G Scott's back yard. The kids loved it as well as some of the adults. Grandpa Scott tied the sled to the back of the four wheeler and drug them around. The sled started out in one piece but after a few runs over some rocks it started to break so we layed donw some pieces of carpet so the sled wouldn't fill up with snow. As you can see we made it work. Grandma Scott is sporting our redneck sleigh after it had it's last run! It looks like you guys had a lot of fun over the holidays! Looks like alot of fun!! Your little boys pictures are so so cute, I love his curly hair. Your photographer did a really good job. I hope your feeling better! I want to come see your new house! I have driven by but am still waiting for an invite...hint hint! haha you are so lucky!